Brighton Woods (formerly, The Aspens) has been purchased by new owners and updated. We have families and children and want to give you the vacation rental we would want. We have created this by furnishing all amenities so you can worry about your ski or summer vacation, not what you forgot to bring. We also know what our families want when we go on vacation - clean sheets that smell like fresh laundry, beds with multiple new pillows so you can select what works best for you, a kitchen stocked with the necessities like a waffle maker, coffee and espresso maker, crock pot, cookie sheets, pizza cutter, sippy cups, high chair, an instant hot water line at the sink for kids hot chocolate after skiing. The large living room area is perfect for adults to hang out on the brand new sectional while the kids are upstairs playing games or watching movies in the loft. 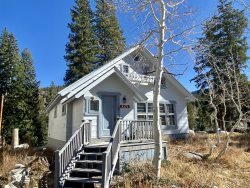 As one of the few 5 bedroom cabins in Big Cottonwood Canyon available for rental, Brighton Woods is the perfect place for your family ski or summer getaway. Was so easy to work with and had simple to follow check in/ check out procedures. We just had a large group stay at the property for a wedding up in the canyon and it could not have been more perfect! There was plenty of space for all 10 of us with the vast majority of the space being kid friendly. Our group said multiple times that well have to book this place again next summer for a reunion! Extremely responsive and very accommodating. Thanks again for making our weekend perfect! Brighton Woods was one of the best ski houses we've rented, in almost a decade of skiing! Location is perfect, house is comfortable, modern and beautiful. Kitchen was huge and very well stocked. Friendly and super helpful/responsive! Would definitely come stay again! Beautiful ski in/out home at Brighton. Perfectly furnished for a cozy ski vacation - great kitchen and family gathering space as well as comfortable beds and plentiful bathrooms. House was clean. Perfect area next to Brighton base. Lots of space for a large party and open living space for entertaining.